If you’ve ever wondered whether you can find gluten free won tons or what the ingredients are in won tons, you’ve come to the right place! Although you can’t buy gluten free won ton wrappers, you can definitely make them yourself with this simple recipe that calls for just a few flours, eggs and water. That’s it! Making gluten free won tons is a labor of love. But you can do it in stages (I’ll tell you how! ), and then when it’s time to fill them to make the best gluten free won ton soup anyone has ever had (Chinese take in! ), you can press the small fingers of the children in your life into service (servitude?) and they’ll think it’s super fun! And then when they get to eat it, they’ll beg you put them back to work the very next day. I think my children would sell me into servitude for just one more bowl of my homemade gluten free won ton soup (see my soup recipe below!). You are going to be amazed at all the uses for these won tons. Even though any time you roll out dough and slice it into 3-inch squares it takes a bit of time, the key here is that the dough is a true pleasure to work with–and it’s even kind of meditative. Plus, the wonton wrappers freeze exceptionally well. Plus, if you’re usually afraid to roll out dough like this, read the instructions and you’ll find that there are tricks to the trade that really make it really easy. Scout’s honor! They stack really well, and will keep in the freezer for months if you wrap them well (only you can prevent freezer burn!). Then, when you know you’ll want to use them, just defrost them in the refrigerator and they’ll be ready to go. Make My Favorite Won Ton Soup: I made a dead simple filling for my wontons in this soup (1 pound ground pork or beef + 3 tablespoons gluten free soy sauce + 3 tablespoons rice vinegar + 1 tablespoon honey + 1 scallion, chopped). Then, place about 1 teaspoon of filling in the center of each skin, moisten all 4 edges of each wonton skin with an egg wash (1 egg beaten with 1 tablespoon water), and close by joining two opposite corners of the skin, pressing out any air and sealing tightly. Brush the top with more egg wash, and bring together both tips on the long side of the resulting triangle, overlapping them slightly and brushing with more egg wash to seal. To make the soup, boil the wontons about 10 at a time in 4 cups boiling chicken stock, seasoned with soy sauce and chopped scallions, for about 4 minutes per batch (or until the meat is cooked and the noodles are tender). Remove the wontons with a strainer, divide among bowls, and wilt baby bok choy in the stock. Divide the soup among the bowls, and serve piping hot. You can also use these wonton wrappers to make my fried wontons in the Air Fryer! If you don’t have an Air Fryer and aren’t interested in one, never fear! I’ve included instructions on how to bake them in the oven or deep fry them in oil. *Notes about Expandex: In this one particular instance, Expandex can be replaced with an equal amount, by weight, of regular tapioca starch/flour. The resulting wrappers will tear more easily and will generally not be as strong. Expandex is currently readily available in the U.S. on amazon.com. In England, Expandex is sold under the name Isabel’s Baking Fix. If you have access to Ultratex 3 and not Expandex, I would recommend trying a mix of 268 grams all purpose gluten free flour + 12 grams Ultratex 3 in place of the blend above. Ultratex 3 is at least 3 times as strong as Expandex. In the bowl of a stand mixer fitted with the paddle attachment (or a large bowl with a wooden spoon), place the flour, xanthan gum and Expandex, and whisk to combine well with a separate handheld whisk. Create a well in the center of the dry ingredients, and add the eggs and 4 tablespoons warm water, and mix to combine on medium speed for about 1 minute (or with the wooden spoon for at least 2 minutes). The dough should come together. If there are any crumbly bits, add the remaining warm water by the teaspoon until the dough holds together well when squeezed with your hands. Turn the mixer speed up to medium-high, and beat until smooth, 3 to 4 minutes (or by hand with a wooden spoon for at least twice as long). The dough should be smooth and pliable. If it feels stiff, add a few more drops of water and mix in until pliable. It should be, at most, slightly sticky but mostly just smooth. Transfer the dough to a piece of plastic wrap, wrap it tightly and allow it to sit at room temperature for about 10 minutes. The dough will absorb more water and any remaining stickiness should dissipate. Unwrap the dough, divide it in half and return half of it to the plastic wrap and wrap tightly to prevent it from drying out. Place the remaining half of the dough on a lightly floured surface, sprinkle lightly with more flour and roll into a rectangle about 1/4-inch thick. Flip and shift the dough often to prevent it from sticking, sprinkling very lightly with more flour as necessary to allow movement. 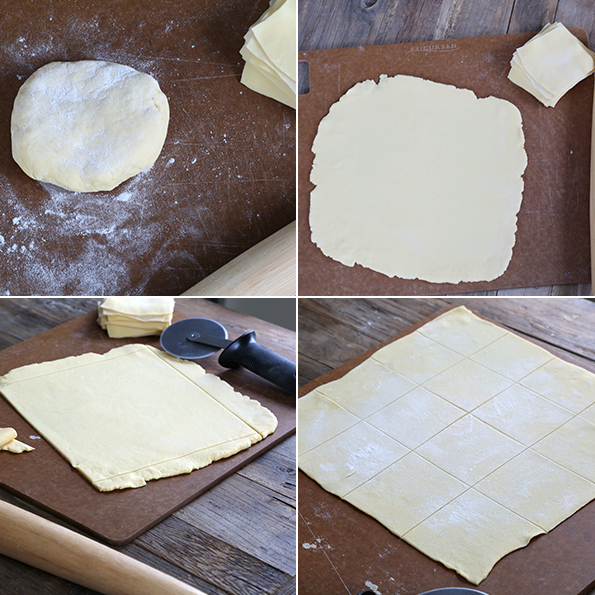 With a pizza wheel, pastry cutter or sharp knife, trim the edges of the rectangle to create even edges. Remove and gather the trimmings, and set them aside. Using even and sustained, but not aggressive, pressure, roll out the rectangle until it is approximately 1/8 inch thick. Slice into 3-inch squares. Alternatively, slice the 1/4-inch thick rectangle into 1 1/2-inch squares, and roll each square evenly in all directions until it doubles in surface area and is 1/8-inch thick. I often find this the quicker, easier way to get squares that are the proper thickness. Use won ton wrappers in gluten free eggrolls, fried won tons, or won ton dumplings for soup. Stack any leftover wrappers, wrap first in waxed paper and then place in a freezer-safe container, seal tightly and freeze until ready to use. Defrost by placing overnight in the refrigerator before using. Adapted from the Won ton Wrappers (page 48) in the book Gluten-Free on a Shoestring (Copyright © 2011) and Flour Tortillas (page 203) in Gluten-Free on a Shoestring Bakes Bread (Copyright © 2013). I use Jules Gluten Free flour which has Xanthan gum & Expandex in it, so would I need to add more Expandex or just add more Jules GF flour to add to the total amount? These recipes look amazing – I am going to grab the cookbooks and play around – not the best cook in the world but I do try hard! Nancy, you cannot use Jules flour successfully in this recipe, I’m afraid. The first ingredient in Jules’ flour is Expandex, so it has way way way too much Expandex to work in my recipes. It is very gummy, and also very starchy. Sorry! have ever made or eaten. tossed into the freezer. Only after I tested 2 of them they are Yummy. and had all the ingred. that BB has so I bought it, it is expensive. It irritates me that people with health issues are taken advantage of when buying food to survive. I believe, that we are all having to go back to cooking like our ancester’s from scratch. Would like to see nutritional data posted on recipes. Other gluten free recipes I have seen are not ADA or dieter friendly. 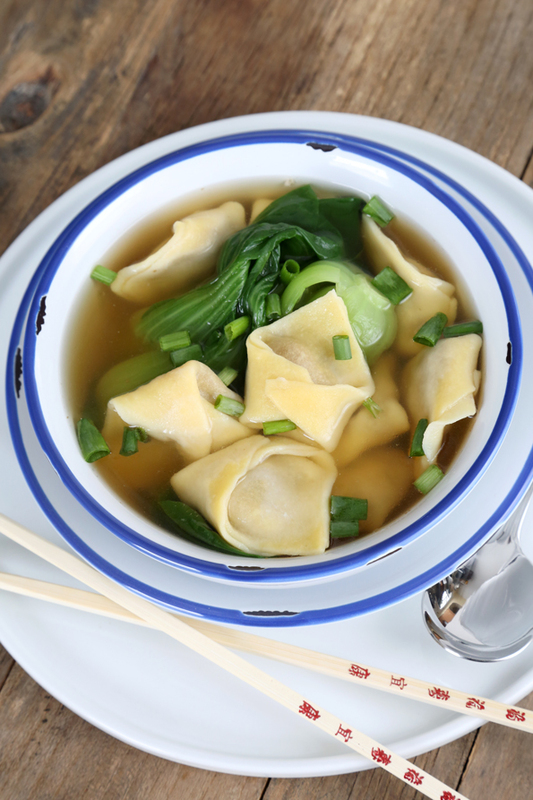 One gluten free wonton (that’s ONE) can have 215 calories, 20% daily sugars, 15% carbs. I have not crunched the numbers on this one, but tasty as they are, you don’t want to eat a dozen! I don’t provide nutritional information on any of my recipes unless I claim that they are “light” or “lighter.” It is simply too time-intensive, and can be done by readers themselves if they are so inclined! 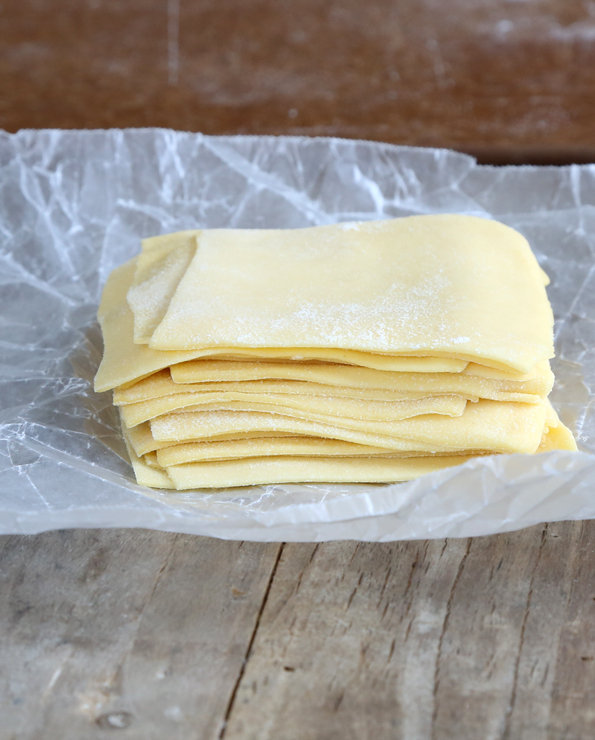 I am excited to use this recipe to make “pasta sheets” for homemade lasagna. It’s been years since I have made lasagna, so this will be a real treat! I guess I don’t really understand about the expandex modified tapioca starch – how exactly is it different then regular tapioca starch? If I don’t use it, would my recipe totally flop…? Thanks! This looks great, Nicole! I remember in Pam Anderson’s How to Cook without a Book, she uses wonton wrappers to make quick, weeknight ravioli. That would be fun to try with these, too! This soup looks fantastic! I can’t wait to try it! I need to definitely give this a shot! Do you think this dough could be run through a pasta machine? I have yet to try the other wonton receipe – but I am sure this one is much better than that one, because you just keep getting better, Ms. Nicole! Oriental dinner can be made on stove top — I think this is going to be part of Sunday dinner in my house this week. Thank you, thank you, thank you for this recipe!! 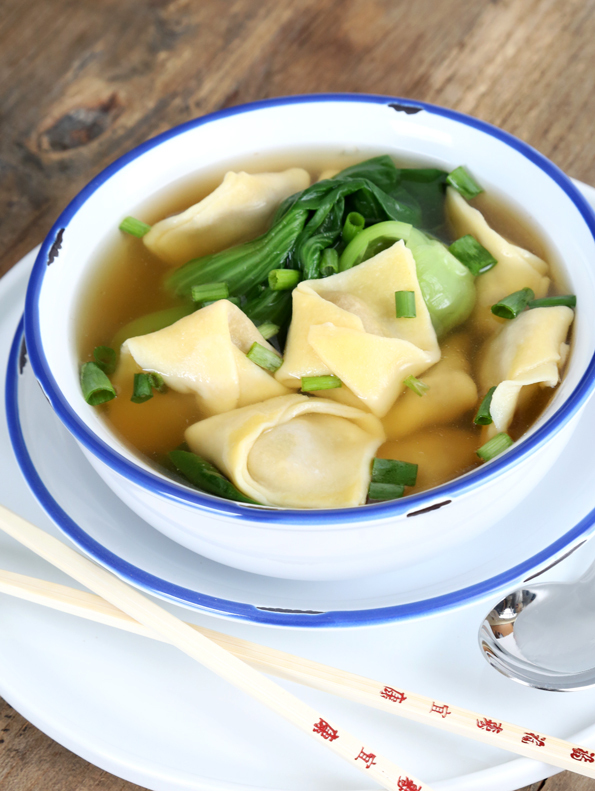 My daughter (celiac, adopted from China) has never had wonton soup and would very much like to – I can’t wait to make this for her! 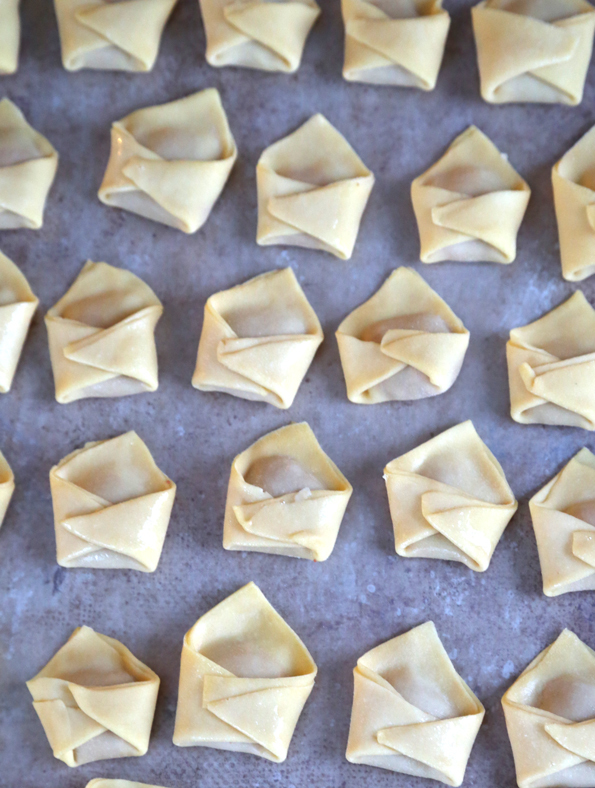 Rolling and folding those little wontons will be a true labor of love, but it will be so worth it. Oh, man, Stitcher, that is too adorable and sweet. That is one lucky little girl. And I’m definitely getting a bit choked up! What do you think? Could I use this dough for samosas? That would be so great as I miss samosas more than anything! I don’t see why not, Melisa! Do you think they would work for egg rolls? Of course they will, Lisa! I agree – I made the wonton wrappers before and loved them. I will definitely make this version too and freeze, freeze, freeze. I need another freezer!!! :) Thanks for all your great recipes! Once again, you have made my day! I don’t when I will get around to making these, but you can bet I will put them to all sorts of good use soon! I LOVE Wonton Soup. Haven’t had it in ages for obvious reasons…but i can now!! I would love to know what your process is for developing all these recipes, Nicole, but I’m sure that is a trade secret. ;o) Still exploring my GFOAS Bakes Bread and cannot wait for some days off in a row to get my hands “dirty!” Thank-you for all your hard work!